Last Wednesday, July 26, viewers across the country joined in Navy PO2 Timothy Birckhead’s joy and emotion as he received his HFOT home in an episode of ABC’s The View. Timothy’s home reveal wasn’t the only surprise. 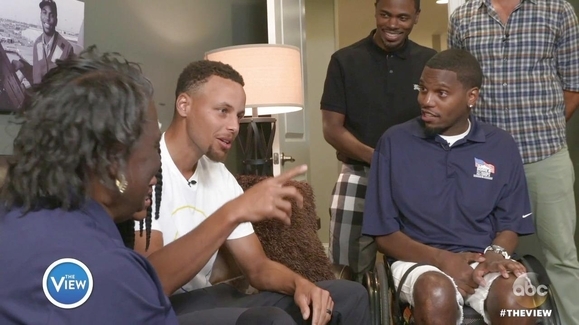 His favorite basketball player Steph Curry of the Golden State Warriors stopped in for a visit with Timothy and his family as they toured their home for the first time. Entertainment Tonight covered the unexpected meeting. If you didn’t get a chance to watch Timothy on The View or you just want to relive the excitement, you can catch the episode here. Homes For Our Troops builds and donates specially adapted custom homes nationwide for severely injured post – 9/11 Veterans, to enable them to rebuild their lives. Support more Veterans like Timothy here.